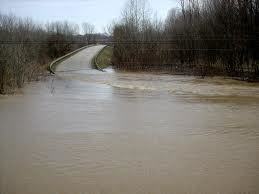 County Road 23 just east of State Route 61 may be impassable by now due to rising water. Sheriff Brenneman reports the southern half of the county seems to have more flooding, with a home on Rd. 165 reportedly flooded. Teh intersection of State Route 529 and State Route 61 is also a vulnerable area and areas around Chesterville reportedly have high water. The National Weather Service out of Cleveland is predicting a 90 percent chaince of rain today with new rainfall amounts between a tenth and quarter of an inch, except higher amounts possible in thunderstorms. A 60 percent chance of rain remains through Thursday night, so relief is not in sight until Friday.